Faial is an island in the Central Group of the Azores Archipelago, formed by nine volcanic islands and located in the heart of the North Atlantic Ocean, at about 932 miles (1500Km) from Lisbon and 2423 miles (3900Km) from the American Eastern Coast. The island, having the shape of an irregular pentagon and an area of 67 square miles (173.42 Km2), lies between the coordinates 38º 31'-38º 39'(North latitude) and 28º 36'-28º 50'(West of Greenwich longitude). It houses approximately 15,000 people, according to figures from SREA, spread by its 13 parishes and its only town - Horta. The relief is irregular, including steep cliffs, small hills, green valleys and black sand beaches. Dominated by Caldeira's volcanic cone, the island has its highest point at Cabeço Gordo, with an altitude of 3422 feet (1043m). In the Azores it is usual to say that all the four seasons can occur in a single day and Faial is not an exception. In the morning a sunny day may be expected, but at lunch time possible heavy showers will unable you to see anything. In the afternoon the rainbow may appear but the humidity level rose so much that you won't be able to breath properly and, at night the sudden decrease in temperature is accompanied by strong winds… but don't be scared! It is true that the weather becomes quite rainy during the winter and spring periods but the only snow will see should be the one over Pico's peak, although it did snow in Faial before. As Prince Albert of Monaco had already commented in his sea expeditions to the archipelago a century ago, the Azores is a region in the centre of the Atlantic whose constant changes in atmospheric pressure influence the climatic conditions over a vast area, and are almost blamed daily for the bad or good weather felt in Europe and North America. Humidity is usually very high, around 90% - and the temperature is mild and temperate, never reaching extremes, varying between 17 and 25 degrees Celsius (62 and 77 degrees Fahrenheit) in the summer months between 13 and 17 degrees Celsius (55 to 62 degrees Fahrenheit) throughout the rest of the year. Severe storms are frequent but usually only leave traces of fallen trees and energy cuts. Owing to the proximity of Pico, whose peak of 7713 feet (2351m) is only 3 miles (5Km) from the sea, the people of Faial usually predict the weather of the following day by observing its cloud formations. If however a more reliable source is preferred, visit the Regional Weather Station. So, if all you're looking for is sunshine, beach and fun, come here in July and August, when the sea is calm, the sky is clear and the animation at its best. If on the other hand you'd like to understand why writer Raúl Brandão called Faial "The Blue Island", come during the feast of St. John on July 24, when every field and road side of the island are covered by big bushes of beautiful blue hydrangeas, forming a breath taking scenery. August is the peak season for tourism, with daily festivals taking place in every island (some even at the same time) and it is therefore more difficult to find vacancies in planes and hotels. This is not the case during the rest of the year but the bad weather may turn out to be a nuisance. 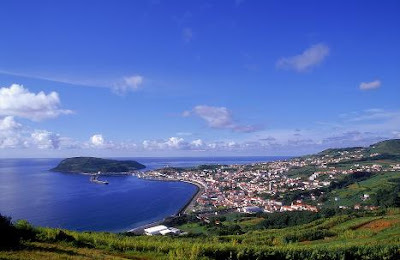 Politicaly, Faial is one of the nine Portuguese islands that form the Azores Autonomous Region, integrated in the European Union, with the Euro as its official currency. Horta is head of the district, which includes all of the island's 13 parishes, and the President of its County Council is Dr. Rui de Jesus. As part of being one of the most important islands, Faial houses the Azores Legislative Parliament and several regional government departments.